On occasion we get the opportunity to connect directly with college students studying design in its various forms. This is always fun for us because it's a chance, not only to see what the cool kids are learning these days, but also to walk down memory lane. This past weekend we hosted the AIGA student group at George Mason University for a studio tour at our office in Falls Church. We talked a little about what we do, who we work with, and discussed some of our design methodologies. In return, we had the chance to see some student work and learn a little about the curriculum at GMU. 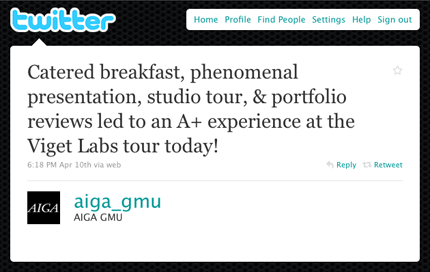 One thing we learned is that GMU agrees with us: writing is important to a designer's career growth. So much so that they've built coursework centering on writing for designers. Yes!